For Mother’s Day this year Michael and the kids gave me a waffle maker, and it has seriously upped our weekend breakfast game. We’ve spent the past couple months perfecting different recipes, and I believe we’ve finally found the perfect one. 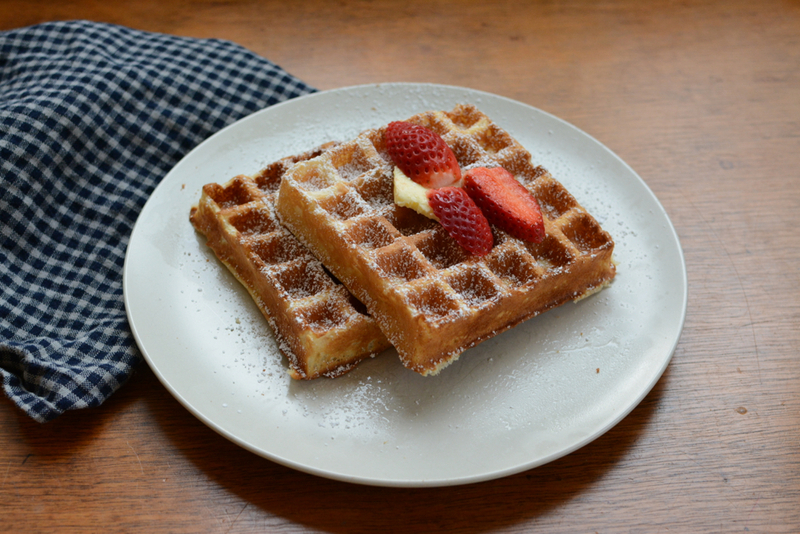 The waffles are perfectly crisp on the outside, thick and fluffy and soft on the inside. They also make a wonderful snack for the beach, so we make a big batch and bring the extras with us in a big container. (You should see the way the kids flock to us like a bunch of seagulls when I bring the waffles out at the beach.) These are definitely a weekend breakfast favourite. Michael bought the Breville 4-Slice Waffle Maker, which is handy because it makes four at a time, and it is so easy to use and clean. 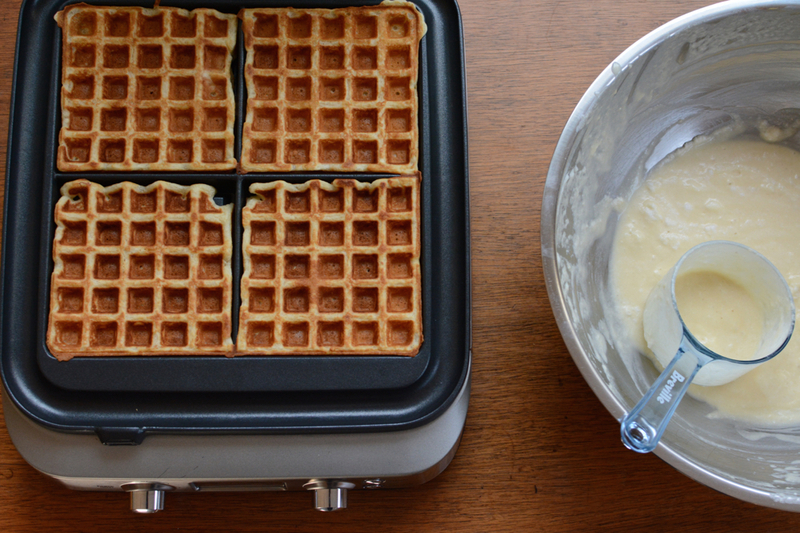 There’s a timer, which makes it super easy to get the cooking time just right, and it means you can focus on buttering and serving the waffles while each batch cooks. Easier than pancakes because you don’t have to stand at the stove and flip. Sift the dry ingredients together in a large bowl. In separate bowl (I use my KitchenAid mixer), separate egg whites and beat until stiff peaks form. In another bowl, mix together the egg yolks, milk, coconut oil and vanilla, and stir slightly. Add to dry ingredients and mix well. Fold in the egg whites (don’t over stir). Cook in waffle iron on medium-high heat for around 4-5 minutes, depending on your waffle maker. Top with butter and maple syrup (my favourite), icing sugar and berries (Marlow’s favourite), peanut butter (Ivy’s favourite), or whatever you wish. Enjoy! They sound delicious – especially when served on the beach! Is there a substitute you could use for the coconut oil? Thanks so much! Thank you for this great recipe! 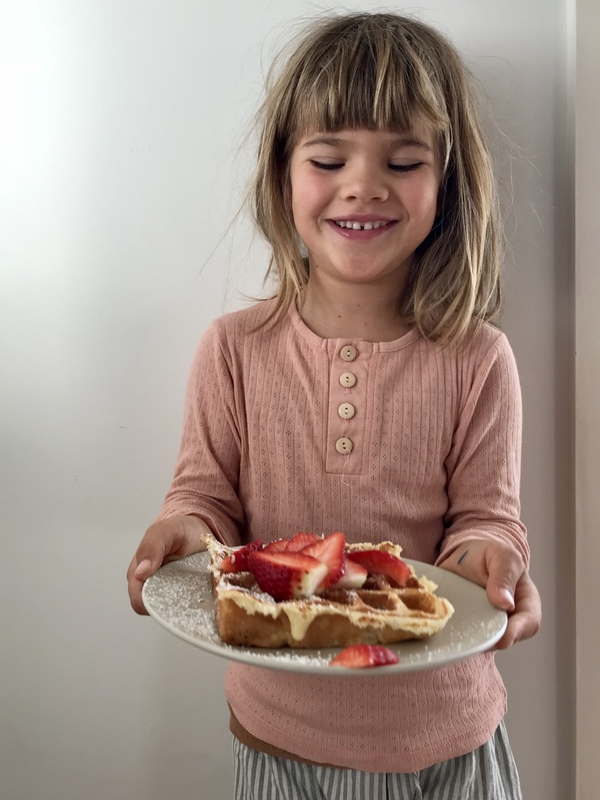 I made these tonight and my whole family agrees they are the BEST waffles we’ve ever had – and we’ve had a lot! In case it helps others – I melted the coconut oil before adding it to the other wet ingredients, but when it combined with the very cold milk it solidified again and I had to melt the wet mixture over a double broiler to get it back to liquid form. Next time I’ll warm the milk up as well before combining all of the wet ingredients.